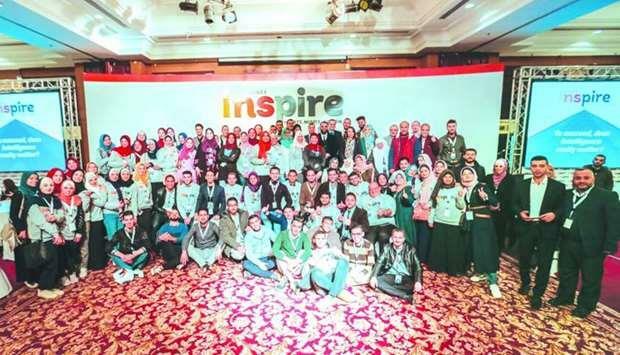 Education Above All (EAA) Foundation's programme Al Fakhoora in Gaza successfully hosted "INSPIRE 2019," to inspire young people and motivate them to work. This conference, in collaboration with the United Nations Development Programme (UNDP), Programme of Assistance to the Palestinian People (PAPP) and Qatar Fund For Development (QFFD) and in partnership with Al Nayzak organisation, discussed current relevant issues in the field of education and solutions related to education and youth. The aim of the conference was to empower youth to speak up and become part of the global conversation on issues in the forefront of education, as well as to share Al Fakhoora students' personal journeys to becoming active agents of change in their communities. Students in large numbers took part in this event. Among them were 120 participants from Al Fakhoora programme and 30 from different academic institutions who were trained by seven world-class trainers on the importance of community building through youth involvement. The event was also attended by 300 delegates, including researchers, decision makers, educationalists, and members of the UN, INGOs and local NGOs. Executive Director of Al Fakhoora Program Farooq Burney said: "Inspire 2019 completely curated and executed by the students of the Al Fakhoora Dynamic Futures programme. "These students are an inspiration not only to their families, peers and communities but also to us all, demonstrating through their actions how everyone can play a positive role for the betterment of our societies." For his part, UNDP Deputy Special Representative of the Administrator Geoffrey Prewitt highlighted the significance of education as a human right that allows youth to achieve their potential, realize opportunities for employment, and develop life skills. "Education is central to growth and development and has remained high on the development agenda of the international community: education is one of the 17 Sustainable Development Goals. Unemployment among youth in Gaza is over 60 %.We have to scale up the investment in creating a movement of education and motivate youth to make social change happen," Prewitt said.